As discussed in yesterday’s Week in Books, I was not a happy camper last week what with being stuck at home (and mostly in bed), laid low with the lurgy. However, one bright(er) spot in the week was reading the latest Dandy Gilver novel and so it was an obvious choice for my BotW this week. This is the twelfth book in the series and sees Dandy called in to help out one of her old friends, who is hoping to restore her family’s fortunes by exploiting the potential of the family pile. The pile in question is a rundown castle, which happens to be located just down the road from a much grander stately home which is due to open for tourist tours shortly. So Min and the Bewer’s have invited a theatre troupe to their castle to put on some Shakespeare, in the hope of attracting some of the visitors as they pass on their way to their rivals. Why does Min need Dandy and Alec? Well, there’s the small matter of a missing jewel, a curse and a long-vanished man that all need ironing out post haste. And as it turns out there is also a host of secrets and lies lurking just under the surface. This has got pretty much everything I’ve come to expect from a Dandy mystery – banter and friendly rivalry between Dandy and Alec, a huge (and somewhat complicated) cast of characters and an interesting setting and set up. It doesn’t have a lot of Dandy and Hugh, which is a shame because they’re often a lot of fun and there’s very little Bunty in this either. But it does have a mystery which will keep you turning the pages right to the end, even if I did figure parts of it out before the big reveal. I’ve said before that one of the things that I like about the Dandy books is that although they appear to be a historical cozy crime series, the solutions to the mysteries are often a lot darker than you find in other similar books – and this keeps that trend going nicely. I’m also impressed that McPherson manages to keep finding fresh settings for these books – I don’t think we’ve really repeated anything much yet through the series. If you haven’t read any of the previous books, this wouldn’t be a bad place to start – although this one doesn’t have a lot of explanation of the backstory to Dandy and her business with Alec. I know I usually advise that you start at the beginning of a series, but this one did a fair bit of evolving over the first few books and which I don’t think really got going properly and hit its stride until about book five. If you want to know more – check out my Recommendsday post about Dandy from last year. You should be able to find a selection of the Dandy books in any large-ish bookshop and my library always has a couple in as well. The hardback edition of this is available now, but my copy came from Bookbridgr ahead of the paperback release on February 8th, so if you’re an ebook reader it might be worth hanging fire on buying it until after that as the price often drops when the paperback comes out and the Kindle and Kobo versions were an eye-watering £13.99 at time of writing. Another Recommendsday post, another crime novel. 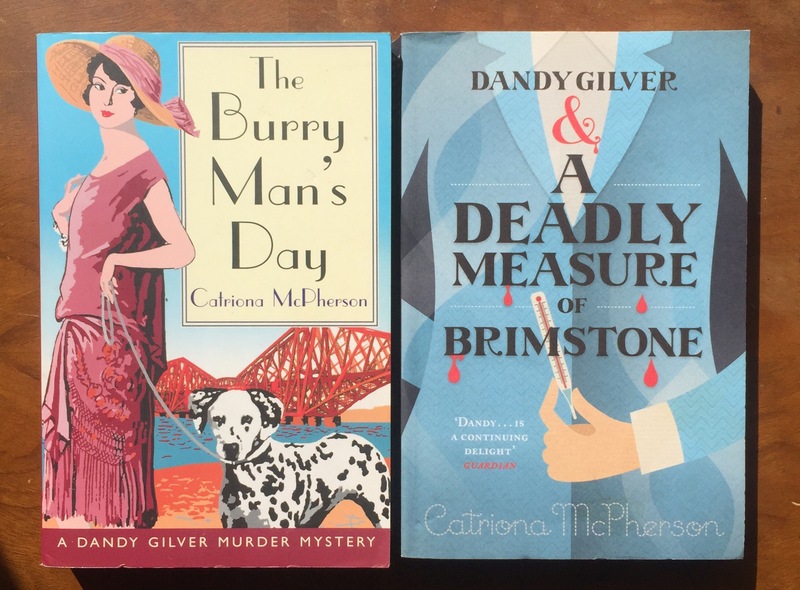 This time though it’s historical crime and the Dandy Gilver series by Catriona McPherson. I read number 11 in the series – Dandy Gilver and a Most Misleading Habit – at the weekend and was reminded how much I like this series. The previous book in the series was a joint BotW about 18 months ago, but perhaps didn’t get as much love as it deserved so this seemed like a good time to revisit it. I’m trying not to hold the non-matching covers against them! Dandy is an upper class lady turned private detective in the wilds of Scotland in the 1920s. She falls into detection when some diamonds are stolen at a ball and discovers that a) she enjoys it and b) she is really quite good at it. Soon she’s started her own detective agency with her friend Alec and the cases start coming in. Dandy’s husband is not keen, but is prepared to put up with it (and the money it brings in) as long as her activities are thrust in his face all the time. I think the series starts fairly slowly, but really hits its stride by book 5 when Dandy goes under cover as a lady’s maid for a case, although I like the second one, Bury Man’s Day a lot as well. In …Most Misleading Habit, Dandy is investigating a death at a convent in an arson attack, while Alec, her partner in detection, is looking into a break out at an asylum nearby which happened on the same night. The two must be connected – but an old war chum of Alec’s is being blamed for it and Alec is convinced that he’s being framed. What really happened and who is it that’s still sneaking around the convent? Dandy is often shelved with the cozy crime books – but it’s a bit darker than that. They do have their humorous moments, but the solutions often involve issues that you don’t come across very often in this sort of book. I’ve spoken before about the Daisy Dalrymple and Phryne Fisher series, and Dandy is definitely darker than Daisy and as dark as the darkest Phryne’s. I’ve read all bar one of the series now – and they’re really worth your time. You don’t necessarily need to start at the beginning – and several of the installments are very competitively priced at the moment. I’ve just bought the missing one while writing this because it was only £1.99 on kindle – but a couple of them are only 99p and one of them – Dandy Gilver and an Unsuitable Day for a Murder is one of my favourites and gives a fairly good indication of what the series is like. Oh gosh. I had such trouble picking this. It came down to two choices – the latest Dandy Gilver book, which I devoured Sunday-into-Monday last week or Jojo Moyes Me Before You, which I was *sure* I had read, and then realised that I hadn’t and really ought to get in there quick before the sequel arrives on Thursday. But, if I make Me Before You this week’s BotW, then what happens if After You is amazing. But then what happens if After You isn’t awesome – and I haven’t said my piece on Me Before You. Basically, this boils down to a lesson in why I shouldn’t get behind with books. Which is what this whole blog is about. And you know I’ve written this whole opening paragraph without actually having decided – the post title just says Book of the Week and I’m still dithering. Dang it. Double-header special it is. On to Dandy Gilver and the Unpleasantness in the Ballroom, which is the 10th in the interwar-set detective agency series and finds Dandy in the ballrooms of Glasgow investigating threats made against a dancer. I’ve read just over half of this series and this is as good as any of them. I love the dynamic between Alec and Dandy (although as I’ve not read a couple of the early books so I think I’ve missed some bits there) and the dance hall world of Glasgow is compelling. And despite the pretty covers, the plots are often quite dark and there’s a (relatively) high body count. They’re smart and different and don’t rely on murder mystery cliches, but without going for lots of sexual violence. So there you go – two books of the week this week, a lot of dithering and another lesson in why a big book backlog isn’t good! * And I wish there could have been a magic fix ending, but that’s not how real life works.